Subject:- Clarification regarding grant of Medical Allowance and Employer’s contribution under New Pension Scheme in favour of the employees appointed under SRO 202 dated 30-06-2015. All the departments are, therefore, requested to proceed in the matter accordingly. 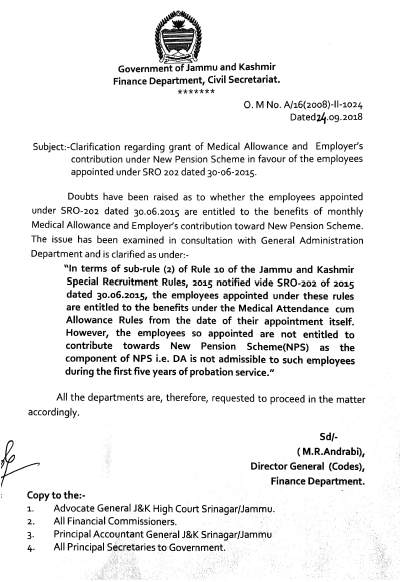 Clarification regarding grant of Medical Allowance and Employer’s contribution under New Pension Scheme in favour of the employees appointed under SRO 202 dated 30-06-2015.